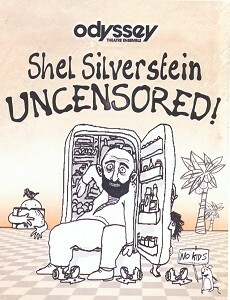 SHEL SILVERSTEIN UNCENSORED, the naughty little revue at the Odyssey Theatre Ensemble, offers songs and sketches by the late Silverstein, who is best known as the author/illustrator of children's books. When director Dan Bonnell discovered that Silverstein had also written (and performed) numerous songs, he put a batch of his things together for the Odyssey production, which features a six-person cast comprised of Colleen Kane, James Macdonald, Tony Pasqualini, Sarah Brooke, Daniel Zacapa and Martha Gehman. Together these gifted comic actors and singers deliver scintillating performances and make the 90-minute show flash by in a twinkling. Whether satirizing a bickering married couple, a huckstering salesman (trying to auction off a woman), or male obsession with certain parts of the female anatomy, Silverstein cuts deep and hard, exhibiting a savage and somewhat misanthropic humor. His songs are equally rude and unromantic, though always funny.